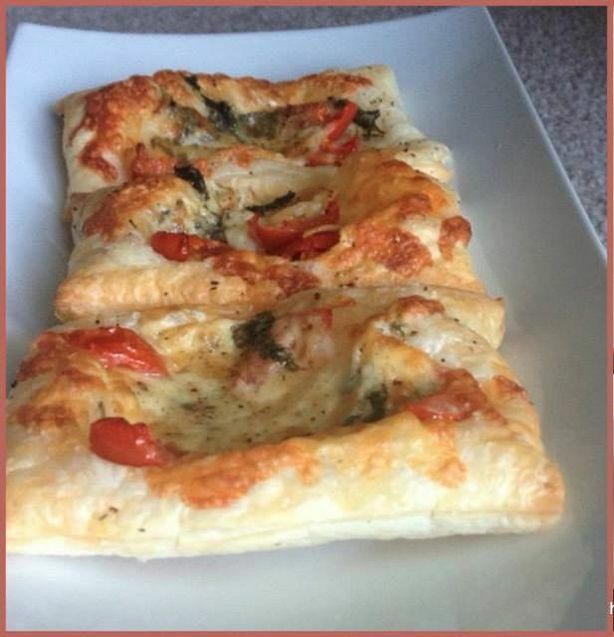 I always keep frozen puff pastry sheets handy to make a quick snack and it is a lifesaver when entertaining too. One such quick and amazing snack/ appetiser is the caprese tart. Flaky and crunchy puff pastry sheets are topped with juicy tomatoes complemented by basil leaves and mozzarella cheese. This recipe calls for few ingredients thereby making it a quick-fix for those cheesy hunger pangs. Note: Recipe makes 6 single-serve tarts. Pre-heat oven at 180ºc for 5 minutes. Thaw the puff pastry sheets and once thawed, cut it into into 6 small rectangles. Brush or spray the surface with oil. Place the pastry sheet rectangles on the oil-coated surface. Assemble the tomatoes, basil leaves and mozzarella atop each puff pastry rectangles. Sprinkle salt, pepper and chilli flakes. Pop the tray into the oven at 160 top 180*c for about 15 minutes or until the puff sheet has flaked up and slightly browned. If you can’t get cherry or grape tomatoes, add thinly sliced regular tomatoes. Add more dried herbs of your choice depending on your preference. Instead of shredded mozzarella, you could also add sliced mozzarella. Oven times and temperatures vary. Keep checking to ensure the tarts don’t burn.